We’ve done away with silos, created cross-functional teams, learned to collaborate and gotten to know our internal customers. But something is still missing. It takes something more to create an organization in which everyone feels involved and committed, where they understand what they are a part of, what the organization is trying to achieve and how they affect the results. It takes a focus on what all businesses have in common, but many employees, managers, and leaders don’t know much about: the numbers. 1. Understanding the foundation. This is the basics of financial measurement, including the income statement, balance sheet and cash flow statement. It is understanding, and being able to explain, the difference between profit and cash. The numbers don’t intimidate a manager who understands the foundation. 2. Understanding the art. Yes, finance is an art as well as a science. The discipline must quantify things that can’t always be quantified, so it has to rely on rules, estimates and assumptions. A financially intelligent manager understands where the art has been applied and what that means for the outcomes. 3. Understanding analysis. Once a manager has the first two skill sets, he or she can use the information to analyze the numbers in greater depth. Financially intelligent managers can use tools such as ratio analysis and ROI to inform their decisions. 4. Understanding the big picture. A financially intelligent manager knows that the numbers can’t and don’t tell the whole story. He knows that the economy, the competitive environment, customer needs and other variables all must be considered. Providing education about the numbers is good business practice. After all, businesses are judged, ultimately, by the numbers. (Yes, everything else is important too, but without profit and cash at the end of the day, there won’t be a business at all.) So if people inside the company don’t understand the numbers, they can’t work to improve them. In a financially intelligent organization, trust increases, turnover decreases, and financial results improve. In all cases, leaders and managers know that to create a truly high-performance company, education about the numbers, and ongoing discussions about results, must be part of what they do. Just like in a game, how can the players know their next move if they don’t know the score? Young Manufacturing International, Inc. (YMI) is a real company, focused on its people and its long-term health, a powerful combination to set the stage for creating a financially intelligent organization. On the inside, however, things weren’t running smoothly. Integrating new employees into their strong culture was proving difficult. Productivity was suffering with concerns of job security as positions were being eliminated. Sales were declining due to the confusion that customers were feeling about the acquisitions and stability of the future. There was a growing disconnect between the strategy and the measures that management was being held accountable for reaching. The CEO of YMI decided something big had to be done to put the company back on track. He knew every employee in his organization was the pathway to creating a truly successful organization. Yet he also knew that to thrive long term, there had to be a razor-like focus on their strategy and key metrics. The plan—go “back to the basics”—openly communicated the company’s current status, its strategic focus and goals, and its key metrics. They had to make no assumptions about what people knew about the financial side of the business. They decided to create an executive level, book-camp intensive, business finance course. Commitment must be communicated and demonstrated for all company-wide initiatives. But it is especially important when implementing a Financial Intelligence initiative, because it involves a change in expectations, and sometimes in roles. Open and honest communication is a hallmark of great companies. But it’s tough when it comes to financial results. There are concerns about confidential information or that data might get into the hands of competitors. There is a fear that employees will misinterpret the numbers. Think about this, though. In public companies, most investors know more about a company they’ve invested in than the employees working in that company. Investors study the annual report, maybe listen to earnings calls, and check in on quarterly results. This is not usually the case for those inside the company. The Financial Intelligence factor for YMI has gone through the roof. Participants have gone back to their business segments re-energized and refocused. They understand the measure of success and how to drive them to reach their goals. Meetings are much more effective, especially their quarterly business meetings in which segment management presents their numbers and defends their actions to the senior team. Prior to the financial training, these meetings were frustrating for all—senior leaders felt that segment managers didn’t “get it”; segment managers felt “beat up.” Now discussions include healthy debate and well-defended action plans. Everyone is speaking the same language. They are feeling motivated and energized. Increased revenues, lowered expenses, and improved employee productivity have ensured that the company is well positioned to continue its growth strategy. After the first year of courses had been rolled out at YMI, the senior managers realized they needed to educate the rest of the workforce to have a truly financially intelligent organization. A one-day version of the executive course was created and an intensive train-the-trainer program was developed for internal facilitators to teach the course to all non-management employees. Facilitators are paired up into teams of two—a respected finance person and a business professional. Ultimately, YMI created a top-to-bottom, company-wide Financial Intelligence education movement. 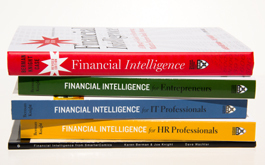 Financial Intelligence doesn’t end with acquiring the skill set. It must be practiced and applied, speaking the language, asking questions, and using the knowledge to make better decisions. A financially intelligent manager becomes an active participant in the success of the organization.